Tag Archive | "dave sexton"
A few days after her death, my grandmother comes in through my bedroom window after lights out. I am six years old. She does so again on other nights. The dream always follows the same path. Malevolent twilight and her body framed against it, her back turned to me. The head slowly coming round; and the face wrong, changed, and wicked with appetite, wholly intent upon me; my rollercoastering nausea coming up and my fear: my stomach clenching, then darkness, a chorus of voices howling in the black and I’m falling, down, faster and faster and gritting my teeth, holding my eyes shut until I impact on the bed and waken into a chamber that’s unlit and alive with menace. I’ll hold still on my sheets, tight and noiseless, til sunrise. Three years later, and I’m in my father’s living room in a town two and a half hours’ drive from home. Windows at each end let in album cover sunshine and there’s snow outside. Alone but vigilant for raised voices starting up away in the house, I’ve turned the stereo’s knob to tuner and found Radio 2. Football: the voice of Peter Jones. Or was it Bryon Butler? Or Alan Parry? Kenny Dalglish and Liverpool are playing my Manchester United. I’ve been waiting for this game: waiting for it in the way you wait for a school bully, or a bombing raid. The speakers smell of cloth and dust, and their rich bass tone adds a luxury and a cruelty to what is unwinding, inevitably, out on the pitch at Old Trafford. I am armless in this fistfight, powerless, unable to do anything to help. What’s forgotten now, except by those who were children at the time, is just how frightening Liverpool were. And in particular, just how frightening the one player every 8 year old had heard of was: Kenny Dalglish. Back then, Dave Sexton’s United was a team of friendly, fatherly figures. Gordon McQueen, Joe Jordan, Martin Buchan, Brian Greenhoff. Ipswich had them too: Mick Mills, Paul Cooper. You could imagine them joining in your playground kickabouts; you could imagine them wanting to; you could imagine them being the sort of grown-up who knew what to say. I won some of my United team at school through Panini flick-card competitions. If you had Dalglish’s card, which hardly anyone did, however, you wouldn’t enter it. You kept it separate. You kept it clean and undogeared. It gave you power and standing, in a way and of a kind that everyone understood. For children, iconic power is hard, tangible. 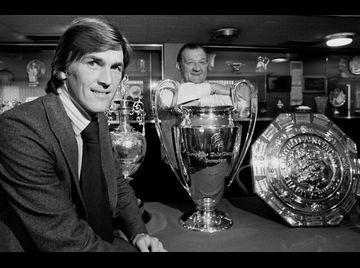 Our best playground player knew it, and when he got the ball he’d shout out “Dalglish!” and dribble around you all, endlessly untackleable and unbeatable. What made it worse was that my Liverpool fan mates seemed to have been Liverpool fans forever. They’d inherited their team through some distant, mysterious group exercise in wisdom and integrity from which I, foolishly and unknowingly, had absented myself. Ending up with Manchester United felt like an act of carelessness. Because everyone was Liverpool.. Dave Sexton’s team spent that season fighting Coventry City for a mid-table spot. I’m still United now, and of course, you might say, it ended well. Not so much of a supporter after Heysel, of course. Blind allegiance died that day: now it’s warmth and best wishes, no more, because no more could be justified. Nevertheless, I could wander down to the Baillie in Stockbridge in 2011 to catch Liverpool v United in the Cup and feel somehow shielded by all those titles and trophies. I could relax on a good seat with my wife in that great navy captain’s cabin of a pub, wander over to the bar for a pair of pints and some crisps, and get ready for a game that wouldn’t have a great deal at stake for me. But just before kickoff, Kenny Dalglish emerged into view, framed against the light from the tunnel. He was deep in conversation with – Sammy Lee? with his back to us, and as Dalglish slowly came round towards the camera, I saw his face with another thirty years on it, changed, wrong, and wicked with appetite: somewhere inside, I felt an ancient vertigo that I’d thought grown-out-of, beaten and outrun, starting up once again and I remembered what it felt like to fall, what it felt like afterwards to cling on silently, too frightened to move..
It’s one month later. In their last game, Manchester United lost to Wolves. Liverpool are DWWWW. More PreWar Colour Film from Britain – But Twenties, or Thirties? Why Did British Football Cease To Innovate? Copyright © More Than Mind Games.Original News Theme by .